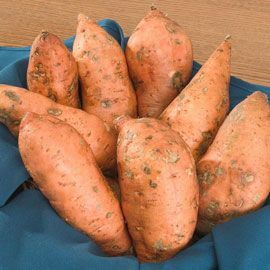 Sweet Potato Centennial | Henry Field's Seed & Nursery Co.
100 days. Plants form well-shaped, uniform roots. Noted for dependably high yields and for lasting storage quality. 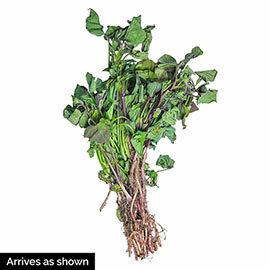 For each offer ordered, get 12 bareroot plant. Spacing: 12 - 15 inches , Row 3 - 4 feet. Depth: 3/4 of stem in the ground of a plant 6 - 9 inch long. Spread: Vine to 20 feet. Color: Violet - pale pink. Soil Requirements: Well-drained, fertile, sandy loam soil. pH 5.0 - 6.5. Growth Rate: Rapid in warm soils. Fruit: Deep copper skin, yellow-orange fine grained, soft flesh. Medium-large cylindrical tapered roots.